Above, Bo, one of Rick Morgan’s three trial dogs, gets a cow back in line during a trial earlier this year. Photo by Sherry Morgan. Almost every evening, Rick Morgan goes out to the rolling pastures of his farm to train. 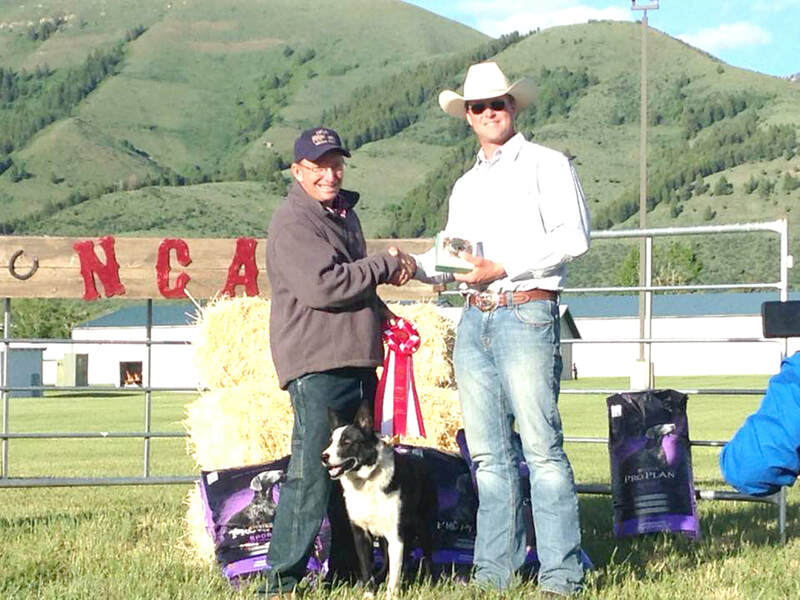 He isn’t training for a marathon or a rodeo; he’s training cattle dogs, and the hard work paid off when he earned second place in the nation, bringing home the title of National Intermediate Reserve Champion title with his dog, Roper, in Afton, Wyo., this summer. Morgan’s interest in training cattle dogs started only a few years ago. He said he had an interest in dogs in 2014, but he started training them and studying it in fall 2015. Morgan’s first trial competition was in January 2016 and over the summer, only a year and a half later, he took second in the nation with Roper. For anyone who hasn’t watched cattle dog trials, the handlers give their dogs directions through whistling and commands as the dogs move cattle through an obstacle course. Handlers are allowed only minimal movements on the course, letting the dogs herd based on their commands, and only standing close enough to close the gate when they get through. Winners are selected by the time it takes the dog to complete the course with the cattle. Morgan started working with dogs for use on his own farm, but he was always interested in competing. He self-trained, reading books and watching videos of how trainers worked with their dogs. The more invested he became in the training and process, the quicker the dogs went through the commands. The training is crucial. Morgan is working with the dogs each evening to hone their skills. His wife, Sherry, said, “He is dedicated. He goes out every single night and works really hard with them.” In addition, Morgan goes to almost every trial during the year. He said there are usually 10 to 12 in a given year. Right now, he has three dogs he takes to trial, and ten overall. All are Border Collies. The reason many use cattle dogs is because it is a low stress way to herd cattle in a way that is also easier for the rancher. It is a gentler way to move cattle if a dog is trained properly. However, breed isn’t a guarantee that the dog will be good at trials. Morgan said, “Some make good trial dogs, some make good farm dogs, some are better with sheep. It just depends on their abilities.” He added that it takes about two weeks for him to get a feel for where their talents are. However, dogs don’t necessarily only have one talent alone. Morgan stated, “You can use a trial dog on the farm and in the trials. It doesn’t have to be just one or the other. “With the trial dog, you need one that will work off of the cattle and be able to control the bite. You have some that are kind of natural at that; they use their presence to move cattle instead of their bite. You have to control all of that. The handler can put the command to bite on if they need to, but it’s more their presence,” Morgan said. Working “off the cattle” implies that a dog does not need to be aggressive to get the cows to move. This year, Morgan won the Central Cattledog Association Dog of the Year in the Novice class and Intermediate Reserve Champion with his dog Red. The points he earned trialing qualified him for national competition over the summer. He won the National Reserve Champion in the Intermediate class with the National Cattledog Association, with his dog, Roper. Morgan works at Cassville R-IV Schools in the maintenance department and lives on a farm in Stella with his wife, Sherry. He has also started training cattle dogs for other people. Rick Morgan is pictured above receiving the National Reserve Champion award with his dog Roper.